Zero Dark Thirty Blu-ray Review Grittier than a mouthful of sand, Zero Dark Thirty is a stark, warts-and-all portrayal of one of the most important events in our recent history. From the other side of the world, it’s easy to picture the United States Intelligence community as being a giant, faceless conglomerate; a hydra of data-mining programs and earth-scouring satellites that turned Bin Laden out of his hiding place through sheer computational power. That the goal was achieved through the nous of a small group of people, even one person, is almost inconceivable. 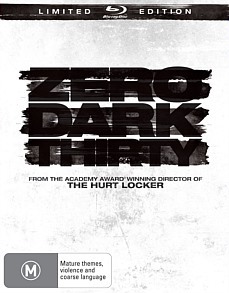 But that’s the surprising, affecting and often desperate story of Zero Dark Thirty as told by director Kathryn Bigelow. The movie’s timeline spans more than a decade, from the trigger-happy period following the invasion of Afghanistan to the more liberal and conscientious times of the Obama administration. Part of the movie’s appeal is watching each of the characters respond to the change in the political environment. Each goes through some kind of transformation, with some being more catastrophic than others. The story is told through a series of episodes, with each contributing to the greater narrative. It may sound odd given the subject matter, but Bin Laden himself is almost a non-event in this movie. He has no dialogue, and appears on screen for a tiny few, partial appearances very late in the piece. He’s depicted as the elusive phantom, the bugbear, the splinter in the mind’s eye who haunts and taunts the characters through every moment of their lives. To the main character of Maya, played convincingly by Jessica Chastain, he is the embodiment of obsession- not just the goal, but the entire reason for her professional existence. More so as the movie progresses, Jessica Chastain is a force of nature on screen. She becomes increasingly haggard and emotional during the movie, and her transformation is the most harrowing-and captivating- to behold. Her character is what drives the movie forward. One by one, each of her doubters become casualties of one kind or another, leaving a trail of bodies and ruined careers in her wake. You get a sense that the actors are relishing some powerful lines of dialogue, although the best is -of course- saved for Maya herself.
? Geared Up: A very cool and fan-boyish look at Zero Dark Thirty’s arsenal of weapons, including the all-important stealth helicopters which play a pivotal role in the movie’s final action sequence.
? The Compound: Recounts the incredible re-construction (digital and then physical) of Osama Bin Laden’s compound. The final product matches exactly what we’ve seen on the news countless times, adding to the film’s authenticity.
? Targetting Jessica Chastain: Jessica talks about what drew her to the role of Maya, and how much it took out of her, both physically and emotionally.
? No Small Feat: A proper making-of feature. Kathryn Bigelow and writer Mark Boal discuss story elements, and the importance of making as authentic a film as possible. Grittier than a mouthful of sand, Zero Dark Thirty is a stark, warts-and-all portrayal of one of the most important events in our recent history. Distressing for its depiction of torture, bleak and realistic for its minimal musical score and handheld camera approach. Neither politics nor heroics play a part here- it’s a human story, and it hits exactly the right emotional notes when it needs to.